is an area of 53 acres extending from the Stowford Paper Mill bridge built by John Allen in 1859, under the railway viaduct and up as far as Pithill Farm. The wood consists mainly of native broadleaf trees and a variety of shrubs. For generations the wood has been used by local people for walks, swimming and picnics. In 1980, Longtimber Woods was owned by a family trust which specialised in the conservation of trees and wildlife. 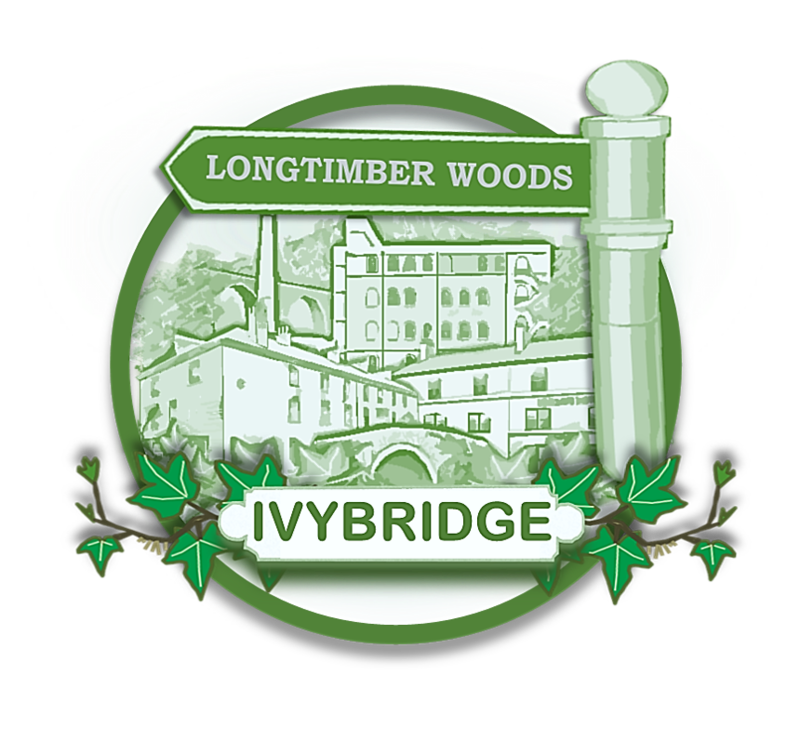 Ivybridge Town Council purchased Longtimber Woods in 1985 to prevent excessive felling of native hardwoods and over the years has made it into a leisure facility, adding signage, seating and exercise areas. The old swimming pool, located in Longtimber Woods was originally constructed as a reservoir in 1874 by the Ivybridge Local Board. This body, acting as an Urban Sanitary Authority, managed the provision of a clean water supply. The reservoir remained in use until 1914, when Butter Brook Reservoir was established on Harford Moor, to supply the growing population of Ivybridge with good quality water. The old reservoir then became a swimming pool with changing facilities and a spring board. The original hut was wooden but this was later replaced by a brick version. In the 1930s the headmaster of the Board School, Mr Luxton, taught many children to swim at this pool. It continued to be used by the people of Ivybridge until the 1960s, although some older members of the community are of the opinion it carried on beyond this. During World War 2, the American soldiers, who were stationed in Ivybridge (at Uphill Camp on Exeter Road) used the swimming pool for training prior to D-Day. Having upgraded the swimming pool area they erected camouflage netting which they had to climb and then, after wading through the water, continued their endurance training on to Dartmoor. Recently work has been completed to create a barbecue and picnic area, with support from Dartmoor National Park. This has returned the once derelict swimming pool to a usable leisure facility for the local community. A short documentary about Ivybridge has been produced by a local media student from Ivybridge Community College. This YouTube video includes a walk through Longtimber Woods and visits the swimming pool area. There is a location in Longtimber Woods which is rich in Devon folklore. Many stories are told of Tom Treneman or alternatively, John Trinnaman, an employee at Stowford House around the fifteenth century. A long Victorian poem by an unknown author relates the story of how Tom died when he fell off his horse and after his funeral, reappeared in his kitchen frightening his servant boy to death. Twelve parsons were summoned, got a halter around the ghost’s neck, and led him to Black Anne Pool on the River Erme. There Treneman was given an endless task. When the river is in spate, the grinding of the boulders is said to be Tom roaring for more rope. Treneman’s tree, a large oak, has now been cut down and only the base of the trunk remains. However, beside it is an unusual granite stone which has a small indentation called Treneman’s Basin. A foot bridge crossing the River Erme in Longtimber Woods existed during the 19th-century and its location is recorded on maps from this period. The bridge was known to have been used by schoolchildren from Harford to get to school in Ivybridge and also by the local residents from Stowford House on their way to work, as it provided a short cut to the railway station. The bridge no longer exists but the abutments still remain. 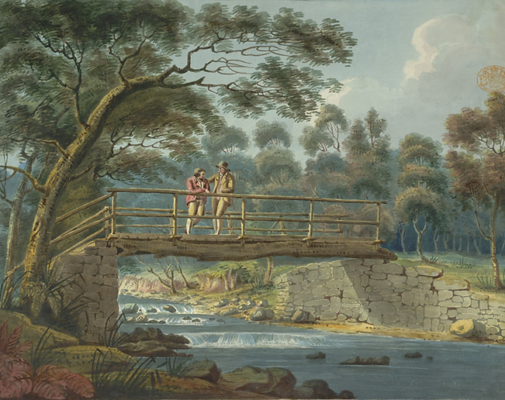 A painting dated 1780 entitled View of the Glenn, by an unknown artist, in the British Library. This shows a bridge which it is believed was located in the woods towards Kings Gutter. Thank you to Maria Preston for the photograph of Longtimber Woods in autumn – winner of The Watermark Amateur Photographic Competition 2017. Thank you to Matt Keeble for permission to feature his Ivybridge documentary. Longtimber Woods is an area of 53 acres extending from the Stowford Paper Mill bridge built by John Allen in 1859, under the railway viaduct and up as far as Pithill Farm. The wood consists mainly of native broadleaf trees and a variety of shrubs. For generations the wood has been used by local people for walks, swimming and picnics.